Augmented commerce continues to develop as a theme in two directions: (1) digitizing the physical world through machine vision and (2) embodying the digital world through Augmented Reality. On the former, a few examples are Bossa Nova Robotics inventory robots deployed in 50 Walmarts, AI guardsman using machine learning on video feeds to spot shoplifters, and Amazon harnessing computer vision to bypass the need for checkouts in its stores. As another example, Singapore-based Trax just raised $125 million (in addition to a previously raised $140 million) to do exactly that. The company owns a powerful image recognition engine for various retail products, which allows retailers to create digital versions of its physical shelf-space. At first, pictures of the shelves were taken by employees with phone or tablet devices. But this can be done with cameras or robots today. Downstream from the image recognition are data and analytics, which managers can use to run the business in real time, across all locations. Just like e-commerce, which provides data that is instantaneous and real-time, the physical environment can become similarly measured and optimized. 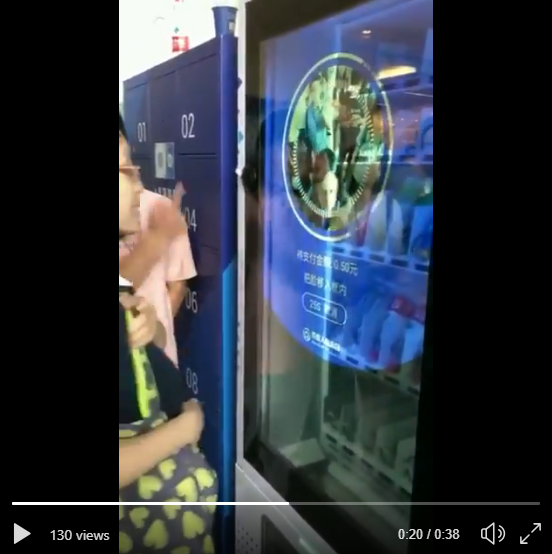 Another version of this wizardry is Baidu’s vending machine concept (see video link below). The user interacts with a voice interface, which projects a menu onto the glass window in the front of the machine. This interface was also touch sensitive, so a user could select the good to buy and confirm by tapping the screen, with payment enabled through facial recognition. While cool, this process was still inefficient compared to pressing a few buttons on the side of the machine. But, over time, we expect to see such smart interfaces spill out further into the world. Which leads us back to finance. Is there a version of a bank branch that benefits from such technology?